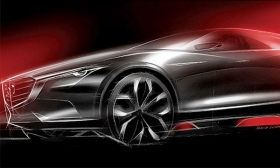 TOKYO -- Mazda's Koeru crossover concept at next month's Frankfurt auto show could preview a sporty Mazdaspeed version of the CX-3 or CX-5 crossover, or a freshening of the CX-5. It also may foreshadow the CX-9 replacement. An update of the large crossover is expected to debut in November at the Los Angeles Auto Show and go on sale early next year. A spokesman said the Koeru would be a close-to-production concept, but did not give specifications or dimensions.